You'll be £15.00 closer to your next £10.00 credit when you purchase Eyewitness Korea. What's this? Today the Korean War of 1950-1953 is overshadowed by later twentieth-century conflicts in Vietnam and the Middle East, yet at the time it was the focus of international attention. It threatened to lead to a third world war, and although fought on a limited scale, it still involved over a million men under UN command and even more on the Communist side. It left the American and British troops who took part with a range of intense recollections that often marked them for the rest of their lives, and it is these experiences that James Goulty draws on in this eyewitness history of the conflict. He uses official documents, letters, diaries, regimental histories, memoirs, oral histories and correspondence to show what the war was like for those who took part. Their accounts vividly contrast the American and British experience as seen through the eyes of individual servicemen, and they throw fresh light on the relations between the UN forces on their different attitudes, tactics, training and equipment, and on the tensions that developed between them. This is an admirable primer for those with very little knowledge of the Korean War. Who knew that the coalition of forces within Korea in addition to the South Koreans, American and British forces there were Australia, Belgium, Canada, Columbia, Ethiopia, France, Greece, India, the Netherlands, New Zealand, Norway the Philippines, Sweden, Thailand, Turkey and South Africa. A problem for the commanders on the ground is immediately obvious. Training, experience, language and coordination! The author sets out to tell the story of the first-hand experiences of American and British ground troops as part of the United Nations Command, which he achieves coherently and perceptively. The book would have benefitted from a map or maps of Korea to help follow the text, as would a glossary of military initials and terms. Though there are explanations in the text they can soon be forgotten amongst the detail. That is the only criticism of this excellent and comprehensively researched work and is probably not the responsibility of the author. The text of this book is first-class; it is packed with information about the Korean War as seen through the eyes of those who took part and is suitable for an audience of all tastes. It makes for interesting reading, and highlights the wide differences between the two sides. The treatment of POWs was poor, only improving as armistice talks made progress. Terms such as 'Bug Out' were in use and which may be familiar to many of us thanks to the long running TV series of M.A.S.H. (one of my favourites). This is a good record of the experiences of those who had to endure many hardships and hopefully will help in making it not such a 'Forgotten War'. As one NCO put it 'you will never be the person you were before you went to war'. Goulty's work draws from a rich resource of memoirs and interviews, and these help to make the book a compelling read. 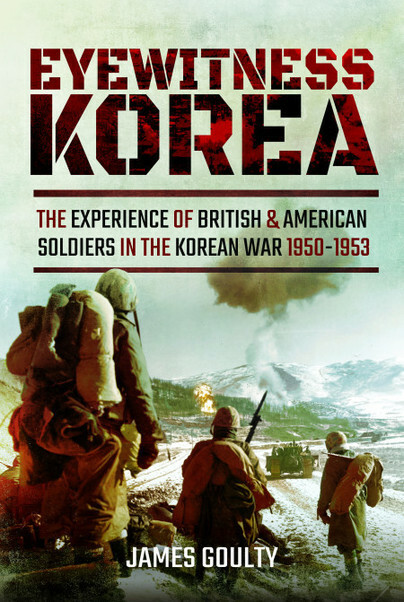 Each chapter contains useful subheadings - a godsend for academics - and there is an extensive bibliography that will be of use to anyone wishing to study the Korean war further.